In addition to the sale of imaging gear, Hunt's offers an extensive array of educational classes covering a broad range of subjects on photography and videography. Group classes as well as individual instruction are available at most Hunt's retail locations. To enhance your photo experience. Hunt's provides guided photo walks and excursions throughout the region. Operated in partnership with the Massachusetts Department of Conservation and Recreation, the Blue Hills Trailside Museum is the interpretive center for the state-owned Blue Hills Reservation and features a natural history museum and outdoor wildlife exhibits. The animals on display, including snowy owls and a river otter, have been rescued and would not survive in the wild. Since 1981, NH Audubon conservation biologists and a legion of dedicated volunteers have worked tirelessly to advance Peregrine Falcon population recovery in New Hampshire. NH Audubon first became involved as organized releases of captive-bred falcons were ending and monitoring of wild-breeding pairs began. From a single cliff-nesting pair that fledged two chicks in Franconia Notch in 1981, to 19 breeding territories that produced a record-high 35 young in 2010, NH Audubon observers have been there for 30 years! Drawing on past lessons and successes, our vision for the coming decades applies our expertise to emerging and accelerating conservation problems faced by raptors and communities around the globe. It is ambitious, specific, unifying, inspirational, measurable, and—most importantly—empowering to the people and communities who bring it to life. Canon U.S.A., Inc. is a leading provider of consumer, business-to-business, and industrial digital imaging solutions. Cannon's commitment and contribution to the environment and to the world community are an integral part of Canon's management structure, product design, manufacturing, & corporate culture. This commitment has inspired a variety of special corporate programs at both the global & regional level. Founded in 1976, EMHW's mission is to promote the study, conservation and preservation of hawks locally and on a continental scale by monitoring migration in Massachusetts; to share data for research and conservation purposes; to promote education and awareness of the identification of hawks and the issues related to migrating hawks and to instill an appreciation for hawks in general. Raptor Research Foundation is an international scientific society whose primary goal is the accumulation and dissemination of scientific information about raptors. Celebrating over 50 years of Raptor Research and Conservation. Since 2000, CCB biologists working with state and federal partners have moved more than 250 wild-reared falcons from the Coastal Plain to mountain hack sites. Young birds have been taken from bridges and other sites with a record of poor fledging success to be hacked. Hacking is a labor-intensive process where young raptors are fed in boxes until fledging age, released, then fed until the birds are capable of hunting on their own and disperse. This program has resulted in the establishment of several known breeding pairs in the Appalachians. The Chicago Peregrine Program oversees Illinois' Peregrine Falcon population. This is accomplished in part by monitoring nest sites, conducting scientific research and participating in public education. 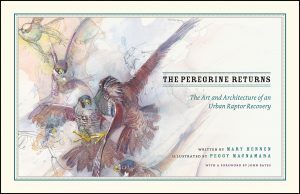 We are very excited to let you know our book on Illinois' Peregrines titled "The Peregrine Returns" is available for purchase through the University of Chicago Press. Just click on the book image to access the site. A Society formed to ensure the survival of Peregrine Falcons in the Midwest U.S. and Canadian Great Lakes region through scientific research, public education, and field monitoring. Earthspan is a non-profit environmental science organization that develops and deploys state-of-the-art technologies for wildlife conservation science and offers basic research and educational outreach in the service of biodiversity conservation. Earthspan conducts long-term studies on migrating peregrines at Assateague Island, MD/VA, and Padre Island, TX. They have expended almost 54,000 man-hours of survey time in observing over 69,000 peregrines and capturing 15,699! Talkin' Birds is a live and interactive radio show about wild birds and the beauty of nature—attracting birds to your backyard, feeding them, and learning more about them. We feature expert guests and contests for prizes like bird feeders and other bird-related items each week. Our mission is to encourage appreciation of our natural world and to promote the preservation and protection of our environment. The Migration Research Foundation is a nonprofit organization dedicated to researching and documenting animal distributions and movements to aid in conservation and wildlife management efforts.